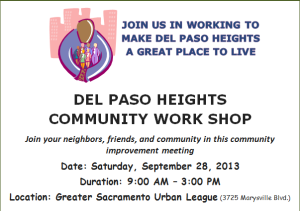 The Office of Councilmember Allen Warren will host a community workshop focusing on neighborhood improvement in Del Paso Heights this Saturday, September 28th from 9am-3pm at the Greater Sacramento Urban League. Creation of and time frame for an action plan. Taking inventory of vacant lots and blight in Del Paso Heights. Learning how to report blight and illegal dumping. 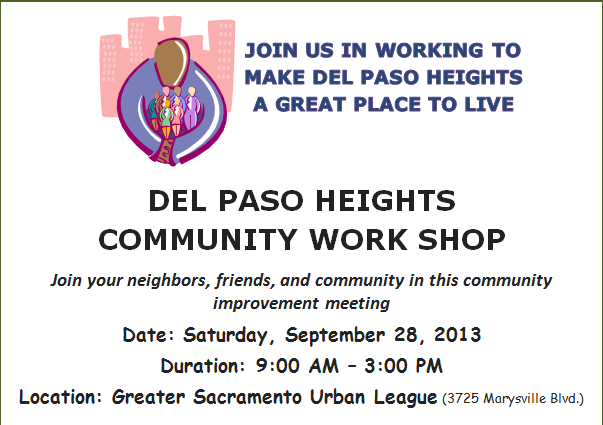 Contact Daniel Savala at 808-7169 or dsavala@cityofsacramento.org for more information.